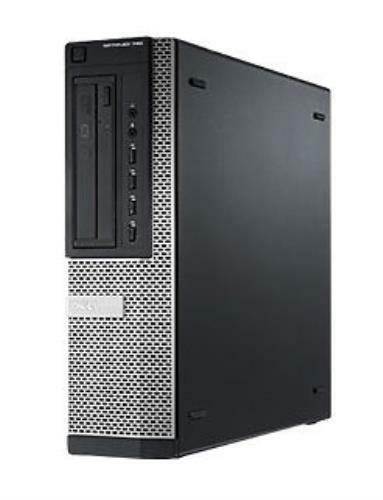 The Dell OptiPlex 790 desktop features a 500 GB hard drive. It is designed for use in a business office or as a family PC. This small form factor PC fits well in small spaces due to the compact size of the tower. The Dell OptiPlex PC also tucks away discreetly in a computer desk cabinet. It comes with an installed Intel Core i5 processor that runs at a speed of 3.1 GHz to evenly process multiple tasks at once. The installed 4 GB RAM can be expanded up to 16 GB if needed. With ample storage space and available RAM memory, the Dell OptiPlex 790 desktop stores dozens of software programs, thousands of songs, and thousands of photos without losing operating speed. In addition, several energy-efficient certifications are held by this small form factor PC, including ENERGY STAR and EPEAT. This Dell OptiPlex PC also offers 10 USB 2.0 ports conveniently located on both the front and back of the tower for additional device connectivity. It features Windows 7 Professional as the installed operating system. Overall, this specific Dell OptiPlex PC comes fully equipped with storage, speed, and connectivity options that work well in a business or home office.